Ee by gum, who would have thought that the Friends would be flying through the air, without the aid of a broomstick? No need to panic, we were ascending on the Anderton Boat Lift near Northwich. This is an amazing feat of ingenious engineering that lifts boats and barges from the River Weaver 50 feet up to the Trent and Mersey Canal or vice versa. Of course as the public purse is in dire straits this is run by a charity the Canals and River Trust. The boat lift is known as the Cathedral of the Canals, well, you are in a hollow structure with amazing iron struts and caissons and you do hear a medley of noises, however it isn’t angels calling or carols but the shuzz of the hydraulic systems transferring one boat up and the other down albeit in a relatively quiet way. Of course it wouldn’t be an outing without coffee on arrival and lunch in the cafe before leaving or a cup of tea and a scone at the end of the afternoon after visiting Staircase House in Stockport. The innocuous frontage makes the house look like a shop and it is indeed next door but one to Blackshaws cafe and opposite the Victorian Market Hall. It is however a hidden architectural mediaeval gem of a house. 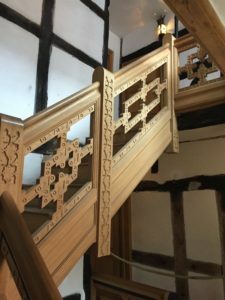 It is the oldest town house in Stockport and is famous for its lovely and rare Jacobean newel- cage staircase. One of three surviving in the country. It’s an interesting study as it has been curated to reveal how people used to live in the 17th, 18th, 19th and 20th centuries. How people worked, slept, played and passed their time is illuminating. Tallow room, Dowry room and Counting house, its all there to peruse. The viewing gallery enables the viewer to see what the areas that haven’t been restored reveal to us today. Wattle and daub and brick infills with hand made bricks are evident, it paints an amazing picture of house construction. 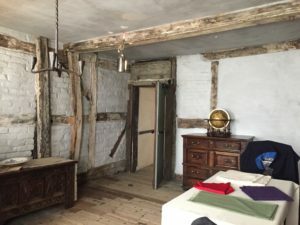 The oldest timber in this building dates from winter 1459/60 and the house although rebuilt at times and in places remained a dwelling until the 1940’s. It underwent a long period of restoration after falling into disrepair, not helped by a fire. Stockport Heritage Trust helped to secure funding from various sources. There are excellent free audio guides. It is very accessible – a good lift. 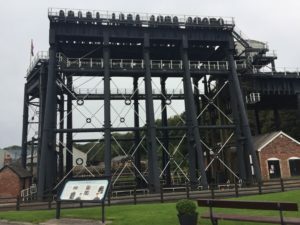 Both these places are well worth a visit, the mediaevalists among you will be delighted by Staircase House and for those of you who may not be keen on industrial history the boat lift is fascinating. All in all a good time was had by all. NB No Witches – North or Middle were harmed during the making of this trip.